Recipe Redux is officially one year old! To celebrate this months theme is Small Bites – our favorite mini-portion sweet treats. You may have noticed many restaurants moving towards this trend of small portions of rich desserts, which I think is wonderful because often I only need a few bites to satisfy my sweet tooth. And I definitely have a sweet tooth. Pretty much anything with a marshmallow is good in my book. I have fond memories of Rice Krispies Treats from childhood and occasionally eat them as an adult. They are probably one of my husband’s favorite sweet treats as well, which is most likely why he came up with this idea and I give him full credit. It is so simple though, I’m almost embarassed to share it. But it is so good and so easy that I can’t resist. It is the perfect summer treat that doesn’t require much time to make or heating up the entire kitchen. It clocks in at just 80 calories, no fat and 9 grams of sugar (roughly 2 teaspoons). This is a fun recipe that could be a dessert bar with people adding in other things like a few chocolate chips or m&m’s, as long as the add-ins are kept to a minimum, which would obviously change the nutritional profile of the treat. 1. 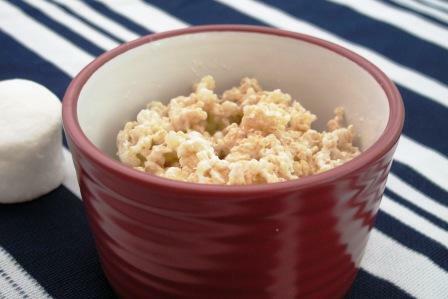 Place 1/2 of the rice krispies in a small ramekin and top with the marshmallows. Heat in microwave for 10 seconds. 2. 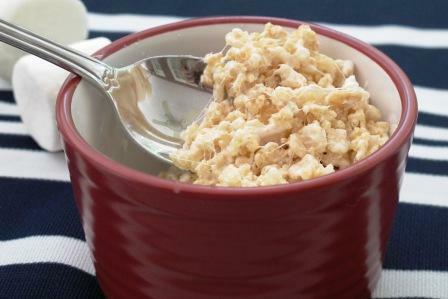 Add the remaining rice krispies and stir carefully to mix thoroughly. Enjoy immediately with a spoon (if you don’t like messy fingers, that is)! 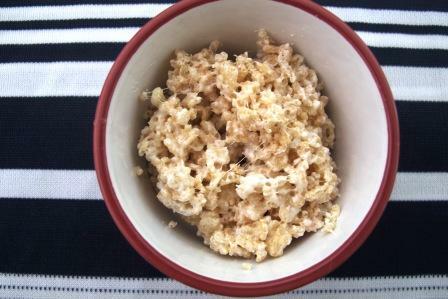 Note: usually rice krispie treats are made with butter, but I don’t think it needs it, though you might disagree. If adding butter, keep it to about a 1/4 to 1/2 a teaspoon.